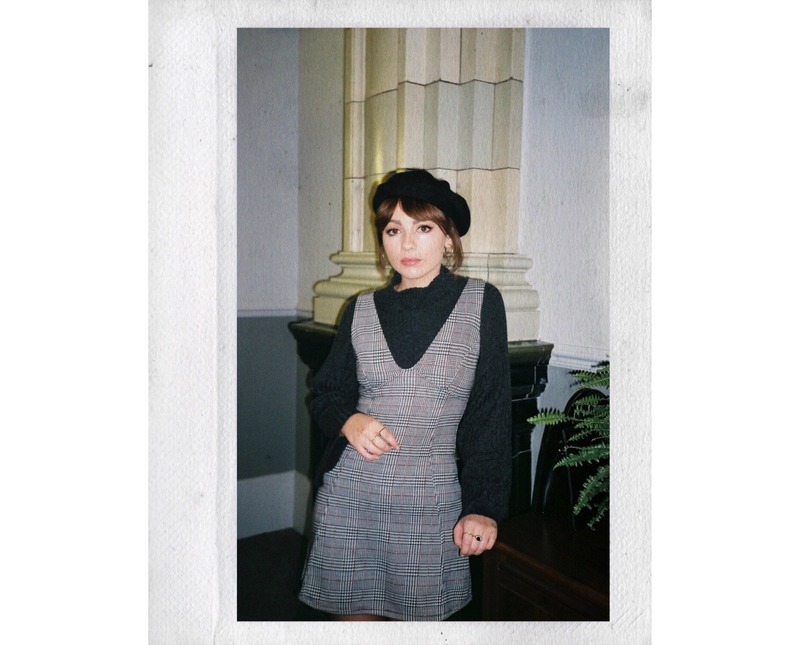 I recently got an exciting email in which I was asked to take part in the #TopshopGirls campaign – you may have noticed lots of your favourite bloggers using this hashtag over on Instagram, whilst wearing dreamy Topshop attire. Topshop is one of those high street stores that will be forever ingrained in me – it’s a place I still shop often, and one that you guys might have noticed I already feature a lot on here. Obviously, I jumped at the chance to work with them, and it feels like a great high to end the year on! The work basically involves me creating a head to toe Topshop look over the next three months, and sharing that look in the hope to inspire different ways to style their endless new in section. 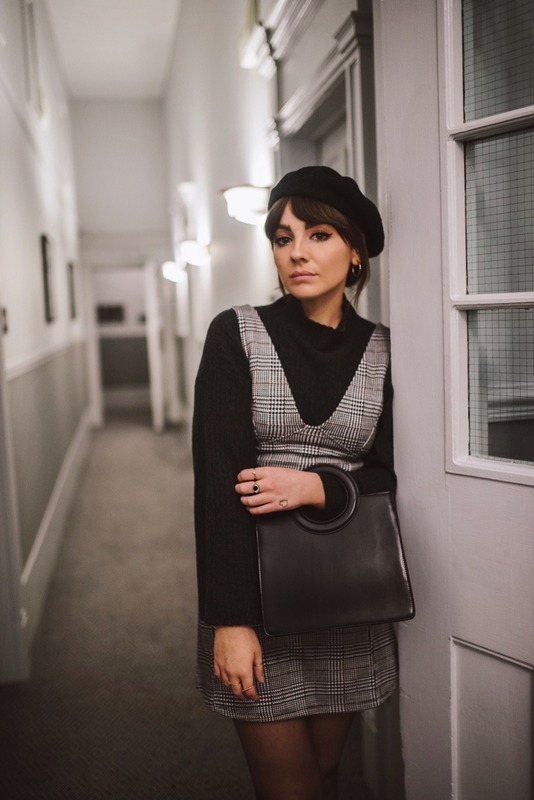 This month I opted for a piece that I had had my eye on for a while – a little check pinafore with a deep v neck front. This style of neckline has been everywhere this year, and it’s definitely not one that I’m tired of seeing – It’s a complete joy for any fellow layer lovers out there! 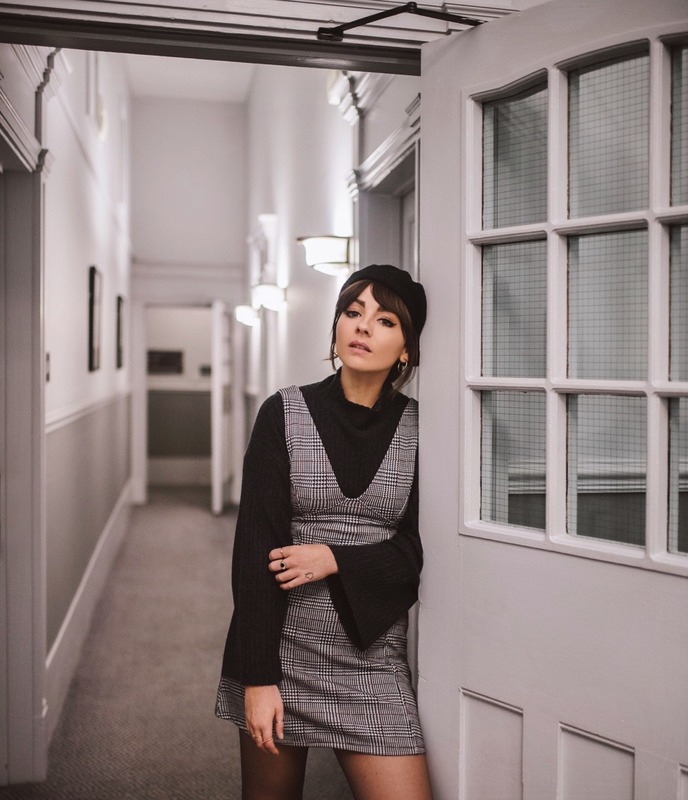 I have worn this pinafore a couple of times as I write this post – once with a blouse underneath for a more evening look, and the other times both with thin knit jumpers underneath. I spotted this ribbed charcoal cashmere one and instantly fell in love with it – cashmere is the perfect winter investment for any man or woman (or pet), and it’s often thin enough to layer underneath dresses without making you resemble some sort of snowman creature. I love how this one features bell sleeves too – they pretty much go hand in hand with an A-line mini for that ultimate retro inspired look. 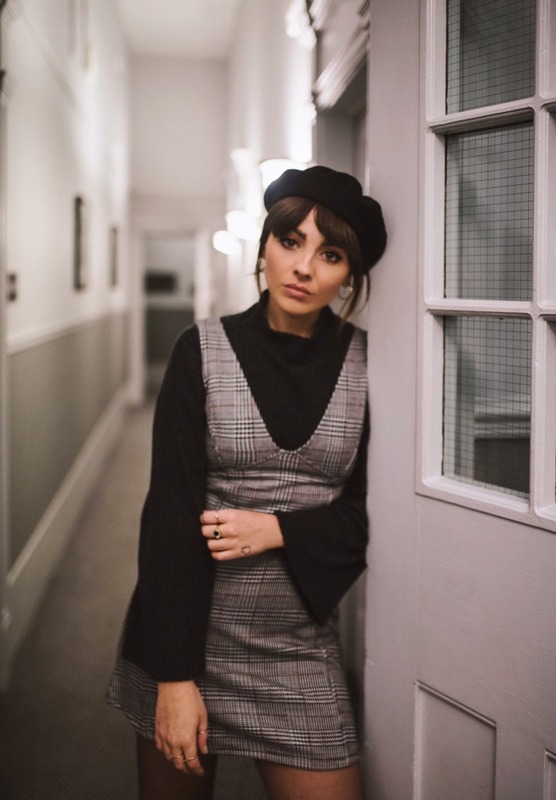 Add a black beret and some ankle boots into the mix, and you’ve got yourself a fail-safe festive look – it’s the smart/casual outfit I’ve been reaching for when I want to feel comfortable, but still look like I’ve made some sort of an effort. I love the square toe boots that Topshop are selling at the moment too – they are another trend that’s here to stay, and one that I have loved for years. They are so comfortable to wander around in all day, and again, have that vintage inspired feel to them! Full outfit c/o – Topshop | This post is sponsored by Topshop! Looking so Parisienne chic in this super cute outfit! LOVE your dress!